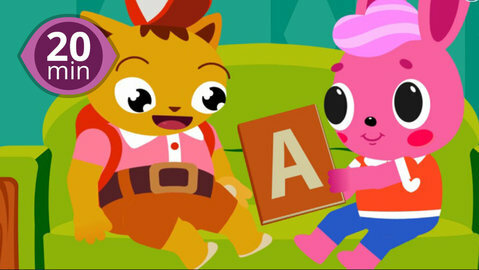 Educational 20 minute non-stop episode will help kids learn the alphabet and is free to watch online! Musical 20 minute cartoons for kids will help them learn and count with lots of educational episodes for free! Felix, the little brown cat, and his friend, Rosie, the red-cheeked bunny, are learning the alphabet by following the alphabet song. So can you by singing along! Watch them console a crying Mr B and laugh along as you learn! Rosie also likes singing the nursery rhyme Mary Had A Little Lamb, so why don’t you sing along with her?! The bespectacled yellow lamb is hilarious and gets up to all sorts of antics with the Felix and Rosie! Enjoy all these non-stop episodes and learn more numbers, shapes, and letters by visiting SeeZisKids.com!